Choosing the proper smoke vent could mean saving a building and potentially lives in the event of a fire. Venting is that important. 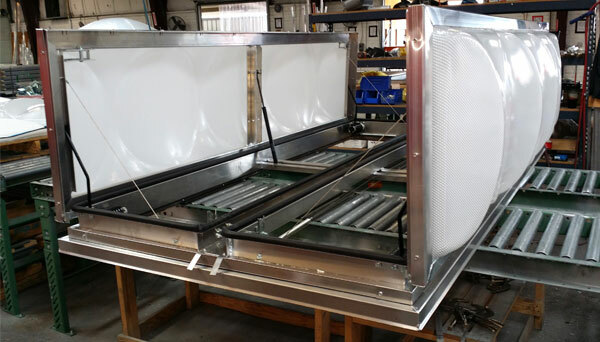 Smoke and heat vents improve visibility and reduce temperatures and hazardous gas concentrations. The enhanced visibility and reduction of hazardous gasses and dangerous temperatures benefits escaping occupants of the building and the firefighters who need to locate the fire. Our involvement in curb mounted smoke vents goes back decades and we apply that experience to ensure your building has the right life-saving, smoke evacuation system in place. RCS offers a full line of smoke vents including both fusible-link and melt-out systems. We will work with you to determine the most efficient vent sizes and combinations to accommodate your floor-to-vent ratio. The IBC requires smoke and heat vents to be provided on a 0.09m2 (1 sq. ft.) of vent area for every 7 m2 (75 sq. ft.) or 9 m2 (100 sq. ft.) of building area, depending on storage height. The IFC establishes regulations affecting or relating to structures, processes, premises, and safeguards from the hazard of fire and explosion. It is intended to outline requirements for existing buildings both the uniform codes and the standard codes required smoke vents. For information concerning the spacing of vents and venting ratios refer to NFPA 204M, “Guide for Smoke and Heat Venting”, and/or 2003 International Fire Code, Fire Protection Systems, Section 910 smoke and heat vents, Table 910.3 under requirements for draft curtains and smoke and heat vents. Full open position of vent is obtained within 5 minutes after initial exposure to 500F - Complies with UL standard 793 for automatically operated roof vents for smoke and heat. - BOCA (’99), SBCCI (’99), ICBO (’97), IBC, IFC & NFPA 204 M(’98) requirements. - Metal building curb mount units or standard self-flashing units for conventional roofs. - Optional manual quick release operation and fusible link activation screen for use with sprinkler system. Meets FM test standard 4430 for heat and smoke vents. - FM product listing: 224A6-AM - Full open position of vent is obtained within 5 minutes after initial exposure to 500F - Complies with UL standard 793 for automatically operated roof vents for smoke and heat. - BOCA (’99), SBCCI (’99), ICBO (’97), IBC, IFC & NFPA 204 M(’98) requirements. - Standard outside manual release. - Metal building curb mount units or standard self-flashing units for conventional roofs. 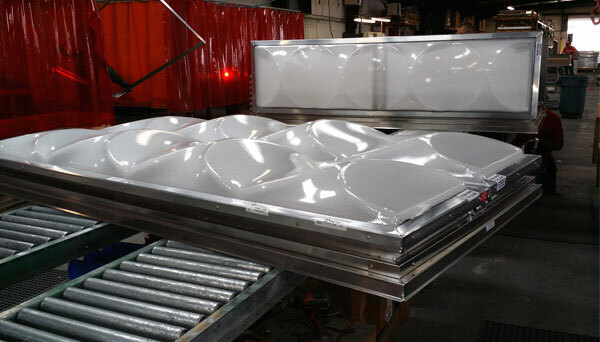 - Optional three wall polycarbonate skylight lids with 0.40 u-value and McCade link used with Heat Detection Signaling and Operations. Contact us today to learn more about our Smoke Vent Systems and determine the right product for your building.